Ladies, if you are looking to update your wardrobe on a budget with a few neat cotton kurtis and palazzos, we just found a place. Thanu’s Kotton Era in Shivaji Nagar is for you to bookmark. Located just around the corner that leads to Infantry Road, we happened to discover this tiny store on one of our Comm Street shopping scenes. Block printed on cotton kurtis, tops, palazzos, and skirts are what’s stocked up here and finding something would require you to browse through the stacks of clothes. 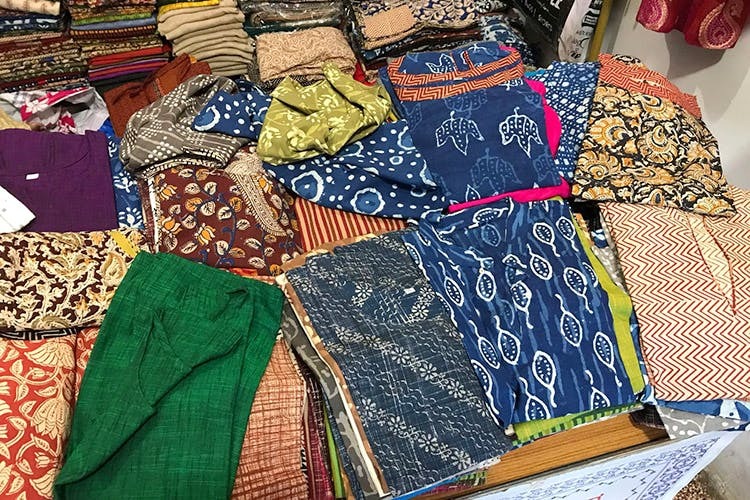 Luckily for you, the lady who runs the store is a patient one and will help you with pick the right sizes.Now, when we say prints expect to find the usual array of animal motifs, paisleys, and flower motifs, along with a few geometric prints. We spotted a quite a lot of sleeveless tops that were priced at INR 300 while nosing around. According to the lady, there’s a lot of demand for palazzos and sleeveless tops, while a lot of college students come for the kurtis. Palazzos and skirts get the same print treatment and are available in solid colours as well. Unlike at the shops at Commercial Street where you can bargain till either you or the shopkeeper gives up, at Thanu’s there’s a rate card put up. The rates are according to length, so, for instance, a 24-inch top would cost you INR 300 while a 40-inch kurta would cost you INR 700. Palazzos and skirts are priced at INR 700 and INR 1,100 respectively. Apart from this, the store also has a collection of handbags, clutches, and phone pouches that features ethnic artwork. These start at INR 150. Ladies, there’s no trial room at the store; wear something light and fitting to begin with, so you can try over it. And they don't do exchange which makes trials rather crucial! They also have a collection for kids as well.